Tension can be infectious. Anxious apologies, ill at ease etiquette, or embarrassingly blurted inappropriate statements are not what you want to be remembered for when entertaining. I’d take the attitude that if you’re not absolutely comfortable with ‘cheek kissing welcomes’ and get confused with the 1 kiss, 2 kiss or 3 kiss conundrum, don’t do it. Only do things that you are totally at ease with. 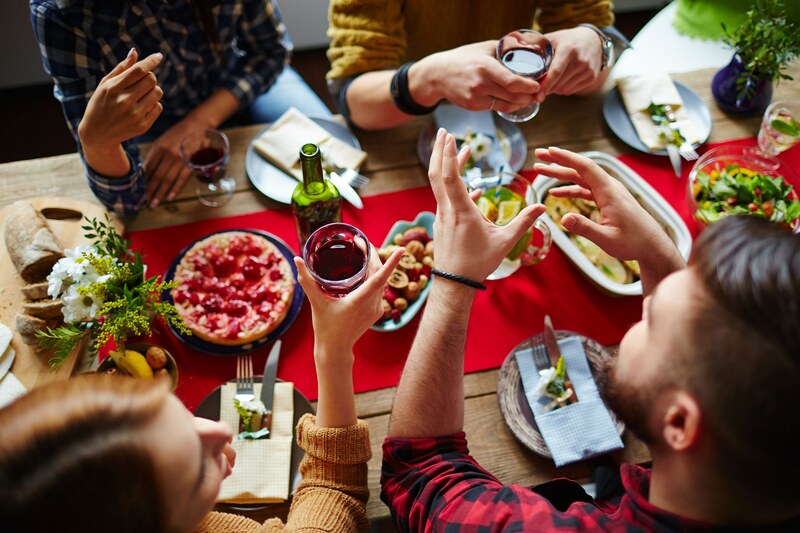 Calm, enjoyable pleasure in other people’s company - that’s probably what most hosts or hostesses (and their guests) are hoping for, so try and keep focused on this simple concept. Plan ahead in a relaxed manner and be sure that well before the event, you have considered everything you want and need. Take a mindful, one step at a time approach. Focus on each step and try to avoid flustering. Avoid self-doubt. If certain guests cannot make it try to be acceptant that there may be many reasons why they can’t take up your invite. Don’t over think it, just be acceptant they will not be able to attend this time. People are coming to socialise with other people whilst having something tasty to eat. It’s not a TV cooking contest, so unless your particular thing is experimental cuisine, go for a meal that you’ve tried and tested, is well within your capabilities, and quick and easy to serve up – reduce internal pressure, don’t increase it. On the day, have a schedule, which starts with the cleaning and ends with you being able to sit and relax for 20 minutes before people arrive. Remember, some of us can be anxious. When initially conversing with your guests, always use their name, even if you’ve known them since primary school. If you have guests who may not know anyone, make an extra effort to introduce them to others quickly – don’t leave them in that awful abyss of isolation. As the occasion progresses unwind and smile, ask lots of open questions, listen very attentively and reflect your guest’s answers. Your friends will feel valued and sense you’re genuinely interested in them. Talk about the other person’s interests without talking about yourself. Try to be kind to yourself and remember that people have come to have a good time with you and the other guests and this good time includes you. Don’t turn yourself into a flustered waiter/waitress. Finally, manage your expectations and be acceptant that the evening will develop in its own inimitable style. Go with it. If something isn’t exactly how you'd like or hoped it would be, so what. Take ownership and enjoy yourself. Enjoyment can be infectious.